My poor lovely parasol is in need of repair that I’m not sure I can find anywhere to give it, so when I found a site that made one-off custom umbrellas, well, I couldn’t resist. 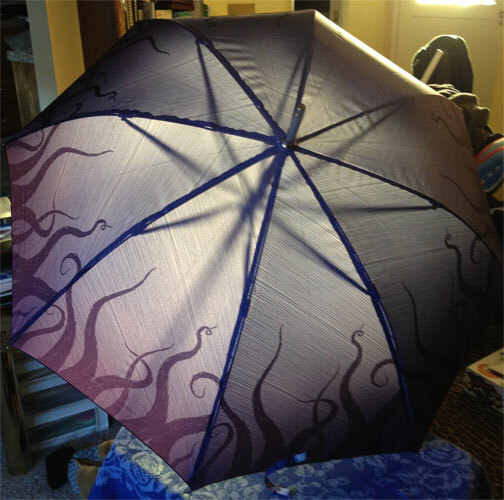 I originally did the design to be another fabric at Spoonflower, but the file was 3x too big for their uploader — oops — so I shrunk it down and used it for the panels of this umbrella instead. 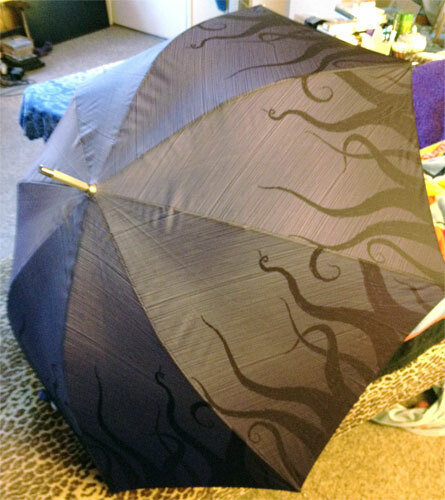 The photos do a bad job of showcasing the way the background fades from light near the tip to dark at the edges, and of course the writhing purple-black tentacles work well with the slanting, rain-like linework. If you look at it up close, you can see that the lines were scanned from hand-drawn pen lines, and the tentacles have that special Sharpie marker feel to them. My poor computer cried bitter tears when I was putting together the full-resolution, layered file in Photoshop, heh. 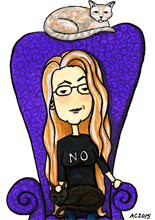 ETA: I’ve ordered a Very Limited Edition of 3 more of these, and two are already spoken for. If you’d like the last one for $40 +shipping, let me know! All sold!